This website is owned by Aloranza Pty Ltd and operated by Alison Kelly. This site collects the following information: the e-mail addresses of those who communicate with us via e-mail; aggregate (not personal or specific) information on what pages are visited; and information volunteered by the visitor (such as through surveys, newsletter sign-ups, and/or site registrations). The information collected is used to improve the content of this website, to notify consumers about updates to our website, and to provide our newsletter to customers who have subscribed. Subscribers can unsubscribe at any time. The unsubscribe link is provided with each newsletter issue, or a request to be removed from the list can be sent to us at the email address above. WE NEVER SHARE EMAIL ADDRESSES WITH ANYONE. PERIOD. 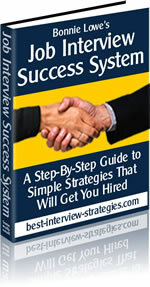 Best-Interview-Strategies.com links to other websites on the internet. Content and Privacy Policies are the responsibility of their respective owners. Limited information is supplied to us in the event of a sale. This includes your name and email address. This information is not sold or distributed to third parties. Credit card payments are processed through Clickbank.com. This information is collected solely for Clickbank.com to securely process the order, and is not accessible to us or anyone else. The DoubleClick DART cookie is used by Google in the Adsense ads served on this website. When users visit an AdSense publisher's website and either view or click on an ad, a cookie may be dropped on that end user's browser. The data gathered from these cookies will be used to help AdSense publishers better serve and manage the ads on their site(s) and across the web. * Google's use of the DART cookie enables it to serve ads to users based on their visit to sites on the Internet.